The current and growing focus on creating life-sized cities involves all manner of tools and areas of interest. A healthy, intelligent transport form like cycling is obviously a primary focus for Copenhagenize Design Company but the picture is always bigger. Providing city dwellers with a myriad of activities within striking distance of the city is important, be it football pitches, tennis courts, running tracks, you name it. As is providing them with the opportunity to take a bike or public transport to these activities. 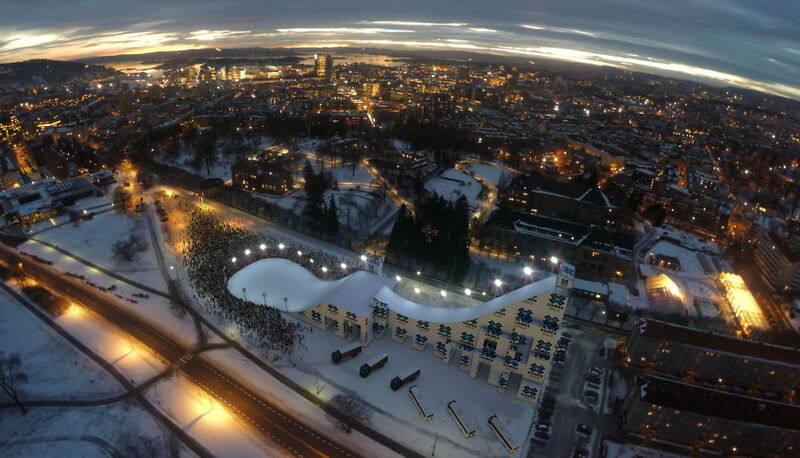 I have just returned from Oslo, where I spent the weekend sampling some "ski urbanism". Going downhill skiing on Friday and cross-country on Saturday and using only public transport to get to and from. Many cities are lucky to have such winter activities in a close proximity. That is not unusual. 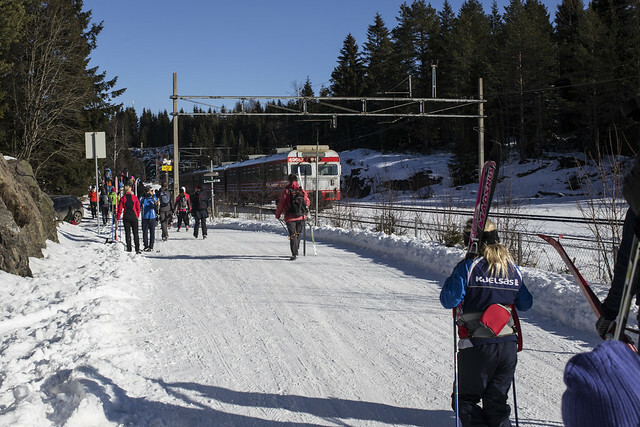 What sets Oslo apart, however, is the totality of their public transport connectivity to winter sports and recreation. It is exceptional and enviable. It also makes it clear why a tiny country like Norway dominates the medal podium at the Winter Olympics. Skiing - especially cross-country - is the most normal of activities for Norwegians. Indeed, as John Oliver suggests, "...the only reason we have Winter Olympics is so that you freakish snow people can pick up your stupid cross-country ski medals". 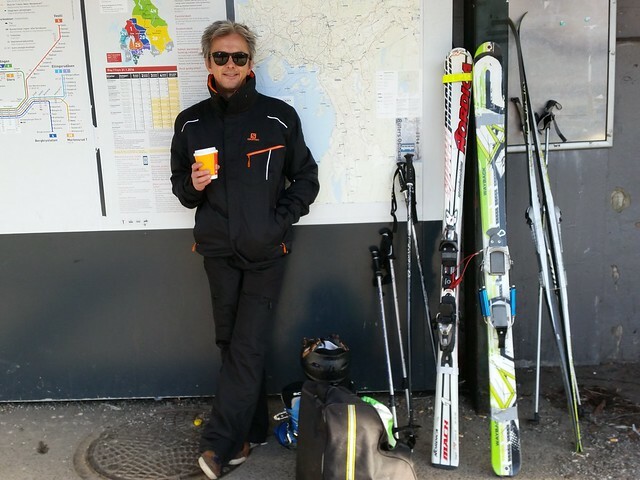 Let's have a look at my intermodal ski bonanza weekend in Oslo. Off we went on Friday, heading from Torshov to Oslo Winter Park. First by bus to Majorstuen and then the T-bane (metro) up the hill. We weren't alone, that's for sure. The Metro was packed with people carrying cross-country skiis, downhill skiis and snowboards. It was a Friday, but it was the winter break so there were many families out enjoying the sun and a temperature hovering around 0C. I discovered right off the bat that the accordian section of the bendy-bus was a perfect holder for our skiis. At Majorstuen station, we grabbed a coffee and waited 10 minutes for the train to take us up the hill. The ski crowd - as well as commuters and the tourists heading to Holmenkollen - got company at Midtstuen station. A horde of passengers all carrying different kinds of sleds/toboggans stormed onto the train. If you didn't know what was happening - you would be as surprised as the French family I saw. But hey! It's the Korketrekkeren! Basically "corkscrew" in English, This is an epic facility and quite unrivalled in the world. Here's the rub: It's a sledding/tobogganing run dating from the turn of the last century. At the top you can rent sleds - or bring your own - and slide down for...get this... TWO KILOMETRES. With a vertical drop of 255 metres. It takes roughly 8-10 minutes to slide all the way down without stopping. Don't worry about schlepping back up the hill. Just hop on the Metro and use it to get to the top again, which takes 13 minutes to get to Frognerseteren station. As many times as you like within opening hours. Tobogganing and public transport. Together at last. OMG this exists. It was a cracking day on the slopes of Oslo Winter Park. The X-Games were in town and there was a half-pipe built in the area and, down in the city, a massive slope was constructed for some urban x-game action. After a smooth bus-metro-bus connection to the alpine world, the next day it was time to try out that most Norwegian of all activities - cross-country skiing. The weather was just as sunny and fantastic when we woke up, so off we went. Down to the tram stop to head towards Marka - the generic name for the wildnerness around Oslo. There was time enough on board the tram to remove some old wax from the skiis and rub on some new before switching to a local NSB train. On that station platform there were scores of people waiting. Individuals, couples, families with kids of all ages and a whole bunch of family dogs. It was most Norwegian thing I've ever experienced. If you exclude eating all their goofy food. Like cycling, in order to ski - and to encourage people to ski - you need infrastructure. Sure, there are probably Vehicular Skiers who reject infrastructure, manipulate data to present a fake perception about the safety of it and who prefer to ski with the snowmobiles, but providing the citizens with ski tracks is a key element in the success of getting people to ski. 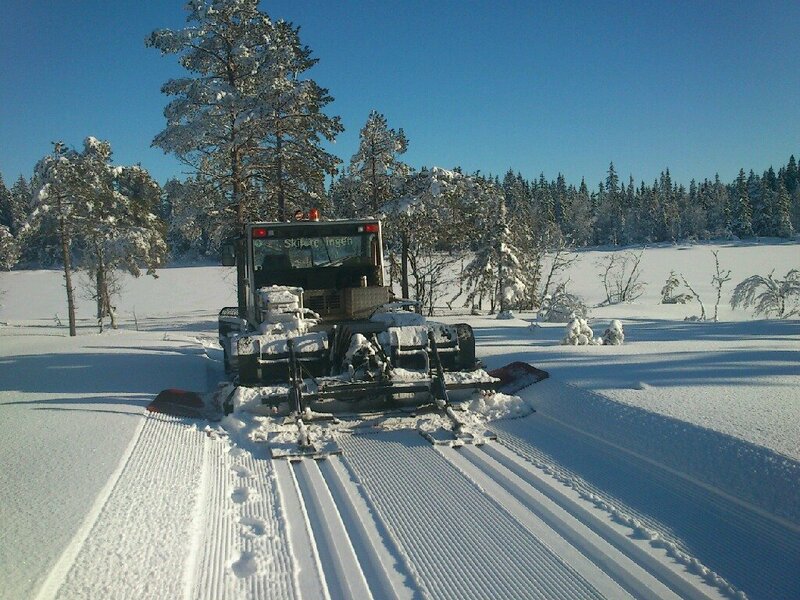 The City of Oslo prepares and marks out 400 km of cross-country ski tracks within the city region and the Norwegian Ski Union (Skiforeningen) does the same for a further 2200 km of ski tracks. Yes. A total of 2600 km (that's 1625 miles for those of you in Burma, Liberia or the USA). Either way, it's a lot of ski infrastructure within easy striking distance of every citizen of the city. It's worth noted that a few hundred of the kilometres are also lighted so you can get ski-busy in the dark, Nordic winter. It requires, like bicycle infrastructure, some equipment. The machines that prep the tracks are considerably more badass than cycle tracks cleaners. But hey. It's a modest investment to make when you are doing epic things for the public health and the urban experience. Like cycling. In its's current state, urban cycling in Oslo lags behind many other European cities, with an estimated modal share of 8%, despite having a history of urban cycling like everywhere else in the world. Nevertheless, we can't wrap up without mentioning the fact that getting to a cross-country track from the city is very doable. As this gentleman will attest. Liv Jorun Andenes from the City of Oslo's Bicycle Project, snapped this photo of this man heading home after skiing. Strapping his skiis and poles to his bike and heading off down the hill. When she asked why he chose to ride, he said, "It's slippery in the winter when I'm walking, so it's easier on the bike". While there is no possible way to steal Oslo's thunder in the matter of ski urbanism, there are times in Copenhagen when such winter activities can be enjoyed. Climate change has slapped mild winters on us lately, but we have our moments. 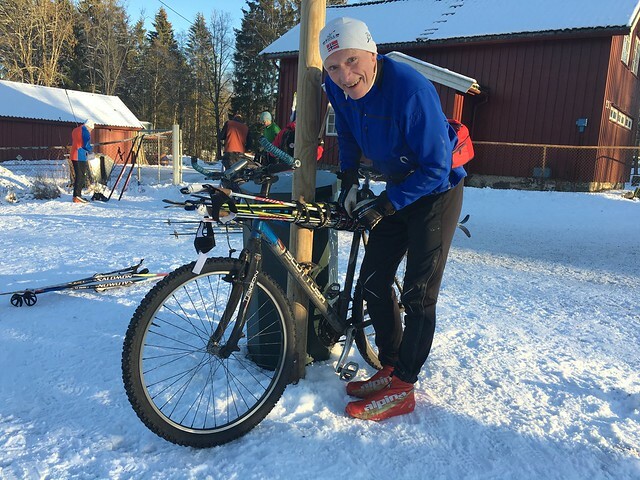 1.5 hours from Copenhagen, in Sweden, you can hit some alpine slopes and, when the snow comes in the winter, you see all manner of winter activities combined with bicycles. Oslo, however, is the world-beater. A life-sized city year round.